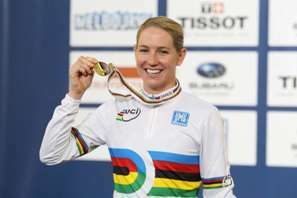 Shanks dominated her final of the 3000m individual pursuit over old adversary Wendy Houvenaghel (GBR) to repeat the world championship title won in the same event in 2009. It brought the New Zealand tally to five medals, one more than the four medals won in 2010 and 2011. That total appeared to be six medals when Matawatu sprinter Simon van Velthooven finished third in the final of the keirin, an Olympic event. However he was later relegated to sixth place after the officials ruled he had squeezed Great Britain’s Jason Kenny and affected the outcome of the race. BikeNZ sprint coach Justin Grace said he was disappointed with the decision which was not one he would have expected in a keirin race but that officials had ruled strictly to the letter of the law at the championships. “Simon knows he finished third in reality and while he didn’t get the fun of standing on the podium he knows there are bigger fish to fry later in the year and he has the knowledge that he can foot it with the best in this sport,” Grace said. 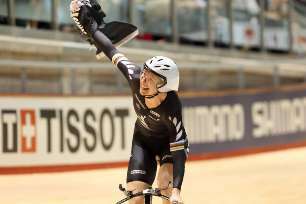 New Zealand’s medals comprised a gold medal to Shanks and bronze medals to the men’s team pursuit, men’s team sprint, van Velthooven in the 1000m time trial and Westley Gough in the individual pursuit. Added to this were three fourth placings in the women’s team pursuit, Aaron Gate in the points race and Alex Frame in the scratch race. Shanks, who set a new personal best of 3:27.268 to best the qualifying, was in front from the second lap. She stretched the gap to 1.5 seconds at the 2000m mark and was in complete control from that point, winning in 3:30.199 on the slower track, with the Northern Irish rider more than two seconds behind. “When they came out with so many fast times in qualifying I thought man I have to make a PB just to make the final. I was absolutely stoked with my rides today,” Shanks said. “I’ve been world champ before but it is so hard to get. Once you have had that feeling once, you want it again even more. “My rides in the TP (team pursuit) showed I had good form. All the data pointed to that but it was a matter of putting it out there. I haven’t been focussing on the individual pursuit so it was a little bit of an unknown but my legs felt great today. BikeNZ is satisfied with the performances at the world championships with the majority of riders performing to targeted goals with some outstanding individual performances. “Seventy-five per cent of all rides were personal bests for the team and it is our best medal haul at a world championship. High Performance sport is all about constantly lifting the game and our riders are showing that across the board,” said BikeNZ High Performance Director, Mark Elliott. “Our male endurance riders produced the third fastest team pursuit time ever without the key rider in Jesse Sergent who is to come back into the team. “The male sprint team continue their progression. We had Eddie Dawkins doing 9.9 which is among the fastest in the sport and Simon van Velthooven winning two medals. This group were initially podium targeted for the 2016 Olympics but are clearly now in the world class arena. “The female endurance group rode their second fastest time ever here and are in the top four in the world. At the same time the women’s team pursuit is a new sport and the two superpowers in Great Britain and Australia have now lifted the bar to a new level and our challenge is to step up to that level by London. “The women’s sprint team knew that timing was tight for them based on the limited events available for London and there was no room for error. Unfortunately one mistake cost them potential Olympic qualification but their international progress has been outstanding. “We came here to win medals in the Olympic disciplines in an Olympic year which we have achieved. Going into the 2008 Olympic year we were not on the podium in any Olympic event at the world championships but this year we are in the top five in four Olympic events. Van Velthooven battled his way through the repechage in the keirin before claiming third place in the semifinal. He had an excellent run behind friend Maximillian Levy (GER) in the final until Kenny came under him. The kiwi held his line and forced his way clear. Hoy pushed through from the inside in the final straight as he held on for third before he was later relegated. Women’s 3000m individual pursuit qualifying: Alison Shanks (NZL) 3:37.268, 1; Wendy Houvenaghel (GBR) 3:27.842, 2; Amy Cure (AUS) 3:28.474, 3; Ashlee Ankudinoff (AUS) 3:28.869, 4. Also: Jaime Nielsen (NZL) 3:35.286, 10; Lauren Ellis (NZL) 3:37.925, 12. Gold medal ride: Shanks 3:30.199, 1; Houvenaghel 3:32.340, 2. Bronze medal ride: Ankudinoff 3:33.593, 3; Cure 3:33.642, 4. Men’s keirin round 1, winner to progress: Heat 3: Hodei Masquiaran Uria (ESP) 1, Simon van Velthooven (NZL) 2, Teun Mulder (NED) 3. Heat 5: Kazunari Watanabe (JPN) 1, Jason Kenny (GBR) 2, Christos Volikakis (GRE) 3. Also: Eddie Dawkins (NZL) 5. Heat 6: Scott Sunderland (AUS) 1, Francois Pervis (FRA) 2, Matt Archibald (NZL) 3. Repechage (winner to semifinal), heat 1: Mickael Bourgain (FRA) 1, Puerta Hernanda (COL) 2, Josia Ng (MAS) 3, Archibald 4. Heat 3: Van Velthooven 1, Jonathan Cermeno (COL) 2, Kamil Kuczynski (POL) 3. Heat 6: Maximilian Levy (GER) 1, Dawkins 2, Pervis 3. Semifinal 1: Levy 1, Wantanabe 2, Van Velthooven 3. Semifinal 2: Chris Hoy (GBR) 1, Bourgain 2, Kenny (GBR) 3. Final: Hoy 1, Levy 2, Kenny 3. Also: Van Velthooven 6 (relegated from third). Women’s 500m time trial: Anna Meares (AUS) 33.010, 1 (world record); Miriam Welte (GER) 33.626, 2; Jessica Varnish (AUS) 33.999, 3. Also: Katie Schofield (NZL) 34.927, 14; Natasha Hansen (NZL) 35.090, 16. Men’s 50km Madison: Belgium 1, Great Britain 2, Australia 3. Also: New Zealand (Shane Archbold, Marc Ryan) 11.